By definition, winter signifies a shriveling of life. Retraction takes a grip on trees and shrubs, and even people, as we pull our hands up in our sleeves, pull our coat collars tight against our exposed necks, and bundle up in layers of cotton, goose down and fur. By definition, winter signifies death, the polar opposite of life, of creation. Evidence of life – greenery, warm rain, gently caressing wind – is absent, nowhere to be found. All of life temporarily submits to the cold, awaiting the dissipating frost, awaiting that first sign of sprouts and roots. Yet until then, hibernation blankets the fields, patience seemingly dwindling from the foreground of bustling production. How ironic, then, that the very symbolization of winter – death – so often creates highly prized delicacies in localities scattered about. From death itself blooms a creation that would not have seen light in the warmth of spring; death nurtures a will to thrive, a will that sparks ingenuity. It is no surprise that humankind’s wisdom blossomed greatly around food and the preservation of it. After all, no matter what the circumstances. one must eat. For survival or for pleasure, exponential wisdom and know-how has been dedicated to ensure the steady intake of food. Such wisdom was ever more vital during the per-cannery era. Today, at any given Safeway or Whole Foods, there exists entire aisles dedicated to canned foods; anything and everything can be canned and stored for, well, until the apocalypse. If I may digress, my high school building was built as a bomb shelter in the fifties, and according to school legend, there were a complete system of tunnels underneath school grounds, all the way out to the baseball field. And along these tunnel routes rested thousands of canned rations. Russian missiles never did come, and our yearbook staff’s efforts to uncover the myth never led to any solid evidence. Nevertheless, the science of canning food for preservation is a relatively new phenomenon in gastronomic history. Preservation of fish has played an integral part in human development. From various parts of the world, where civilizations sprouted and blossomed near rivers, bays and other bodies of water, preserved fish was a critical protein source throughout the year, especially during the cold non-growing months. With no refrigeration technology available, fish was preserved using other sources of wit and wisdom – salting, pickling, smoking and drying. Fermentation was extensively used even in hot and humid climates. In Southeast Asia, fermented fish paste, in its many forms and varieties, are used daily as in important flavoring ingredient in countless local dishes (Cambodia’s “prahok” is something I have wanted to try for years). In Japan, the ancient ancestral sushi, known as “nare-zushi”, was pickled by stacking fish with layers of rice, the season-long fermentation process, often lasting months, breaking down the rice and fish to create its distinct taste and funk. Herring has been pickled as a delicacy in the Baltic and Nordic regions, and Alaskan salmon is just one type of fish that has a Dr. Jekyll and Mr. Hyde type personality change upon smoking. Perhaps the practice of drying fish leaves the least amount of control in one’s hands. No amount of salt, rice or any other pickling agent is used for preservation; in most other methods, variables of similar likeness are under full command of one’s hands. As some may say, “control is power.” Put in another way, the relinquishment of control is a direct loss of power. But the process of drying asks of such relinquishment; all one can do is clean the fish, perform blade work on it as deemed fit, and hang it. The rest is left to nature. Conditions of temperature, humidity and air velocity is beyond one’s reach, and one may dare say that Mother Nature takes over from then on, preserving the day’s catch at her pace in a manner she chooses. In direct contrast to the central element of its definition, winter bears and births one local delicacy in particular that may only be found in the southeast coast of the Korean peninsula. Affectionately called “gwamegee” by the locals, this air-dried mackerel pike is the offspring of the unique environmental and historical roots of the city of Pohang and the North Kyungsang province. Although the exact ancestral beginnings of gwamegee is debatable – most say it started around the early nineteenth century – the preservation process and its unique texture and taste have been passed down through generations. 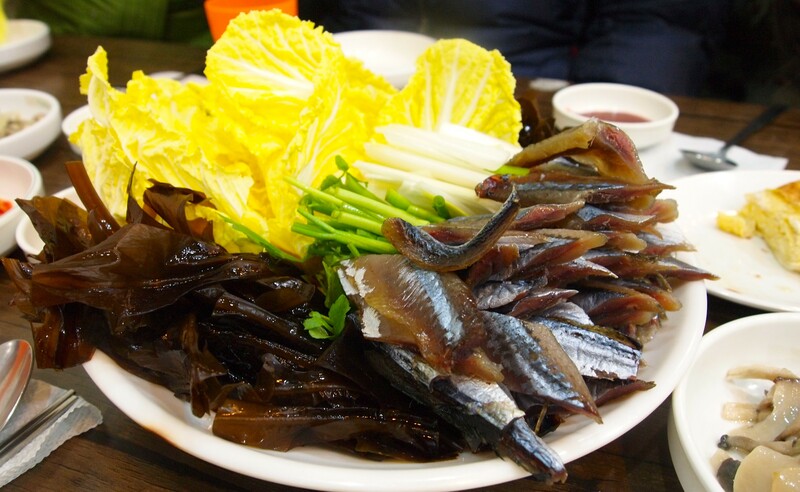 Originally, gwamegee was made with herring, as the fish was caught in great abundance in the seas of Pohang and even upstream in some of its rivers. As the supply of herring diminished, mackerel or saury took its place. 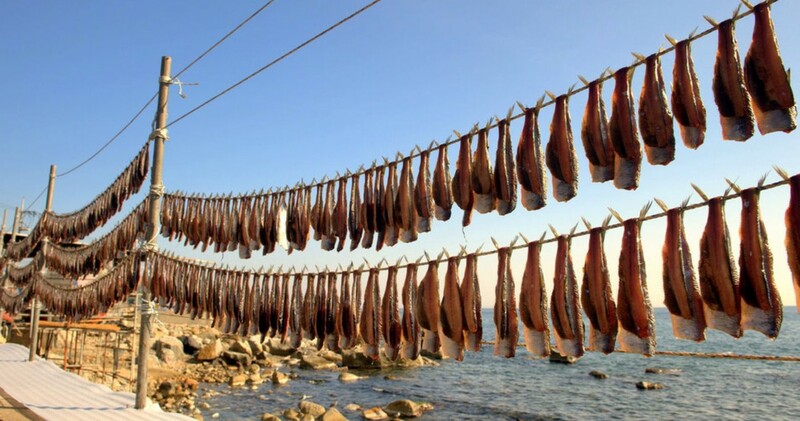 After being gutted and cleaned, the fish is hung in the sea breeze of Pohang for up to two weeks. The flesh, not fully dry, still retains the essential oils of the fish, compacting its flavor. As it was hundreds of years ago, it is best enjoyed with an array of seaweed and cabbages, often with chives, raw garlic, and spicy vinegared pepper paste. This delicacy was so sought after that, in the Chosun Dynasty, kings ordered the artisans to ship cartloads of it to Seoul before the product could be sold in the general market. I once again was reunited with this dish in the most unassuming restaurants in Shinsa-dong, part of the now infamous “Gangnam” district of Seoul – miles and miles away from Pohang. There were no waves to listen to, no ocean breeze to walk against. No seagull in sight, not a fish line in before us. Just Gangnam, in all its deceiving glory. As if reenacting the history of supplying the royalty, the gwamegee was personally delivered from Pohang, just days after it was plucked from the drying lines. No kings of Chosun were present at our table, but with each bite, one drew closer to understanding why the well-fed monarchs anxiously awaited their chariots to arrive from the poverty-stricken coast land. Winter creates. Its harshness is often misunderstood, temperature acting as a deceptively cunning shadow of its true nature. Its slashing winds dig through outer layers, almost seemingly through our bones, but in our modern, everyday concrete jungle, the shrill of the wind is magnified through our man-made wind tunnels. 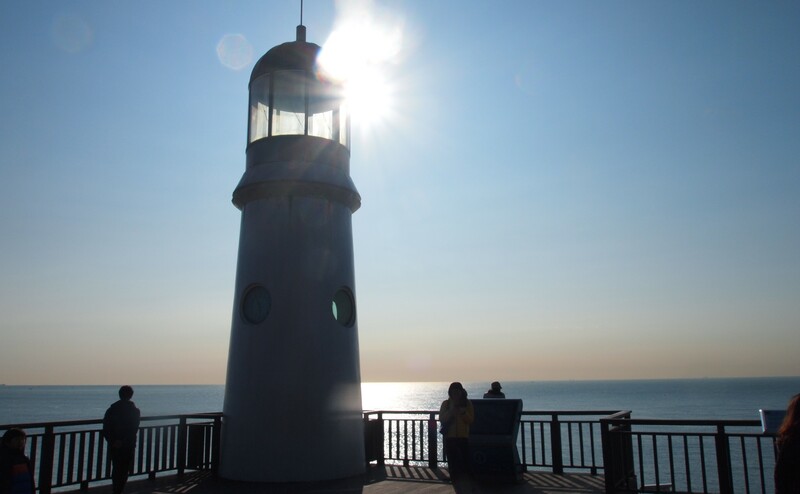 Out in the outskirts of Pohang – and any other quiet sea-side townships – the ocean breeze, even its winter variety, gently caresses the hanging fish, rocking it back and forth ever so slightly. Harshness and shrillness are no longer accurate descriptors. Like a newborn in a crib, like budding leaves and flowers in the early days of spring, the wind here is a nursing mother, cooing her young to the most intimate lullaby. Winter creates. By no means is the temperature cuddly during Pohang’s winter months. But in creation’s perspective, even the cruel thermometer has its place. During the two-week drying process, the freezing temperatures of the night enraptures the fish and freezes it. Throughout the night, as the full moon watches on, the hanging fish is a cocoon in deep sleep, swaying back and forth at times, and holding still as a rock when the wind retracts itself to the depths of the dark. It awaits. When the morning sun bursts open over the East Sea, the gradual warmth of day re-heats and melts the flesh. As a butterfly breaks into the world, so does the fish stretch from the cold of night into a day’s worth of sun. As this process of freezing and re-heating repeats itself for fifteen days, the natural oils of the fish are harnessed, compacting its flavor and nurturing a wonderfully chewy texture. Winter creates. The blistering heat of the summer sun would have overwhelmed the tender mackerel, devouring its nutrients and succulent juices. The winter sun warms the flesh just enough to semi-dry it; only the winter variety of sunshine is sensitive enough to preserve the fish’s distinct qualities. In conjunction with the sea breeze and frost, rays of light stroke the fish gently, gliding over every morsel, every molecule with equal due care. The degree of alarm associated with the microwave oven jolts whatever specimen occupies its chambers; on the contrary, the winter sun is in the midst of a delicate ballet with the rows of hanging fish, allowing patience and time to bloom in their roles as facilitators. Alain de Botton, in his book “Status Anxiety,” quotes the English poet and critic Matthew Arnold, in defining and defending art – and thus creation: “Every great work of art . . . was marked . . . by the ‘desire to remove human error, clear human confusion, and diminish human misery,’ just as all great artists were imbued with the ‘aspiration to leave the world better and happier than they [found] it.’ They might not always realise this ambition through overtly political subject matter . . . and yet embedded within their work, there was almost always some cry of protest against the status quo, and thus an impulse to correct the viewer’s insight or teach him to perceive beauty, to help him understand pain or to reanimate his sensitivities, to nurture his capacity for empathy or rebalance his moral perspective through sadness or laughter. Arnold concluded his argument with the idea upon which this chapter is build: Art, h insisted, was ‘the criticism of life. '” Through plagues, famines, and wars, art symbolized creative vitality. When pressed, humanity responds in full bloom, preserving every percolating ounce of richness. The worst circumstances draw out the best in humanity. When the fields are barren, stripped of its life-giving capacity, frozen solid three layers deep to the core, winter creates wisdom. The need to survive creates the urge to thrive. The slashing winds are different. The night frost is different. Rays of sunlight are different. Previously perceived as villains of angry blizzards and wind tunnels, nature’s ingredients are themselves transformed into creators. Destruction no longer subdues the fields; although still frozen, humanity thrives in the most frigid of temperatures, the darkest of hours. All this is illuminated by winter, which by definition creates nothing but death.